Marshall's attempt at bringing the best of its guitar amps to a Bluetooth speaker has its share of ups and downs. The chic, iconic design translates just fine, but performance and value were lost in the shuffle. Last year, Marshall crashed onto the portable audio scene with the Monitor, a surprisingly good set of on-ear headphones for a company whose legacy is nested in making guitar amplifiers. Now, it's back with the Stockwell, a Bluetooth speaker. Just like the Monitor, it's a chip off the old block, bringing all of Marshall's signature touches of design to the forefront. 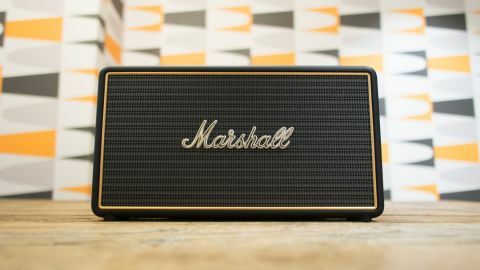 At $229 (£179, about AU$317), the Marshall Stockwell sits between the more affordable and expensive options out there. The Stockwell isn't the best-sounding speaker, nor does it have many of the functions that I've come to expect in today's average Bluetooth speakers. But, if its charming attention to detail happens to win you over (and it very well could), you likely won't regret the purchase. For everyone else, Marshall comes achingly close to a speaker I could outright recommend, but loses out in a few major areas. If you take one of Marshall's standard guitar amplifiers and shrink it down to a tenth of its size, you essentially have the Stockwell. Complete with the ruggedized build, familiar gold finishes and enough knobs and buttons to make you want to touch them all, this Bluetooth speaker riffs completely on Marshall's amplifier design identity – and that's a good thing. The look works just as well at a hangout with your scrappy bandmates as it does on a regal coffee table. The design starts with an optional protective case. It's coated with a tough, leatherette material and some shiny Marshall branding. Once flipped open, the velvety underside of the cover acts as a stand to prop the speaker up at an optimal listening angle. Its looks alone are cool enough to warrant the $40 (£30, about AU$55) purchase, but what's unfortunate is that it's practically a necessity. Without it, the Stockwell can fall over with a slight jolt to the surface it rests on. That said, you can save a little by purchasing the speaker and case bundled together for $249 (£199, about AU$345) through Marshall's website. Moving on to the speaker now, the main attraction is its grille, which rocks a pattern of grouped musical notes. In its center is the white Marshall logo, loud and proud, accented with silver paint. The grille's rectangular face is wrapped by a gold-painted rim. The body of the Stockwell is comprised of smooth black plastic. Most of the Stockwell's functions are featured on its top, which mimics the appearance of Marshall's amplifiers lovingly. From left to right, there's a 3.5mm input for wiring up your device as an alternative to Bluetooth. Next, there's a button to switch between wired and wireless settings (it doesn't do it automatically). There are also a few knobs up top, a style of input you don't often see in the Bluetooth speaker scene. Each can be pushed in for a more seamless look on the top panel (and so that the case can easily wrap around it), but another push will pop them out, so that you can adjust the volume, bass and treble, respectively. There's a button to answer and hang up phone calls, one to enable Bluetooth discovery mode and finally, a power button. It might sound like this speaker has all of the knobs and buttons one could ever ask for, but unfortunately, it doesn't. The speaker lacks a multi-function button to play, pause and skip music. Its absence is a big misstep, and if you want to change the song, your only option is to keep your phone or tablet handy. The Marshall Stockwell operates on a rechargeable battery, and the port to plug in the power source is located on the right side of the speaker. In the box, you'll find a few different plug types, so you can use it abroad as well. Topping off the list of features is a USB port on the speaker's back that lets you charge a device while listening. As far as looks are concerned, the Stockwell has it in the bag. It packs performance, too. But, that's more of a mixed bag. Regarding its output, the Stockwell is well-stocked to put out a room-filling sound, though it isn't the bass-heavy affair you might be hoping for. The three adjustable knobs can help to customize the sound profile to your liking. At its best, the speaker offers incredibly crisp delivery with accurate bass performance. It's just that, at its best, the unit doesn't deliver the deep bass or warmth of sound that I'm hoping for from a speaker that looks this good, or frankly, one that's this pricey. That said, listeners who aren't as nitpicky as myself will probably find the Stockwell's audio capabilities to be sufficient. Using the Marshall Stockwell requires a little more thought than your average Bluetooth speaker. This is because its controls are modeled to look just like those found on a guitar amp. Depending on your familiarity with this type of equipment, this will either be a total breeze to operate, or a nightmare. For me, it was somewhere in the middle. I'm very familiar with both amplifiers and Bluetooth speakers, but more often than not, the amplifier-style layout hurts more than it helps. Even from a few feet away, it's hard to tell what each button does at a passing glance. The Stockwell can also function as a speakerphone, though I wouldn't recommend it. Once I pick up a phone call, the person on the other end has a difficult time making out what I am saying, even when I can't get any closer to the speaker without touching my face to it. On the bright side, battery life is a spot that the Stockwell nails. Its advertised 25 hours of battery life is no exaggeration. This speaker can endure about a week of normal use at medium volume levels before needing a charge. Just expect the longevity to decrease if you're using the USB port to charge a device. Lastly, I had no issues setting up my devices and staying connected to the Stockwell during my testing. The Marshall Stockwell, much like the company's efforts in the headphone space, is a love letter to the guitar equipment that made the company famous. But, compared to the competition in its price range, Marshall's svelte Bluetooth speaker just doesn't offer enough. If you're looking for a Bluetooth speaker in a similar price range that has good looks, offers better sound performance and oodles of features, then the Harman Infinity One might be a stronger investment. That said, if Marshall's signature looks, remarkable battery life and customizable sound profiles are must-have features, you could do much worse than the Stockwell. But, for your money, you're not getting much more than a pretty facade.